I hope you all had enjoyed fall season and some of you still enjoying the season. This year’s weather was quite unpredictable for us Wisconsinites because the temperature in the 60s and 70s in October month sounds like too good to be true. But it happened and weather exceeds the expectation and we enjoyed fall little longer. Enjoying warm weather was fun but it came with few side effects. These year weather experts saying its a fail fall because some of the leaves are totally dried and fall from the tree and some of them are still green and started changing color. Hence, it’s not like you will see rows and rows of colorful leaves but you can see few yellow and few greens. As the weather was unpredictable instead of driving miles and miles we choose to explore nearby spots for fall colors. 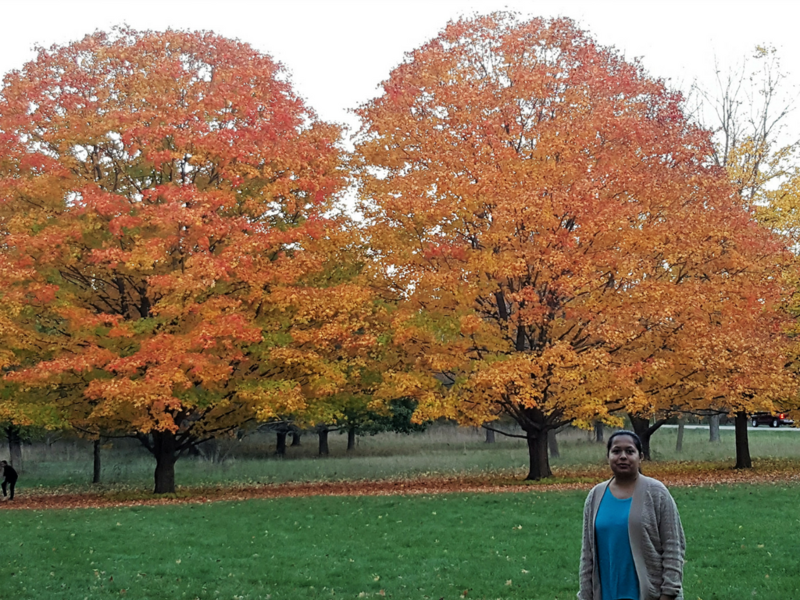 I have already shared 10 spots to see fall colors in the Milwaukee area. I have started my fall bucket list completion from Fall colors in the Whitnall Park. 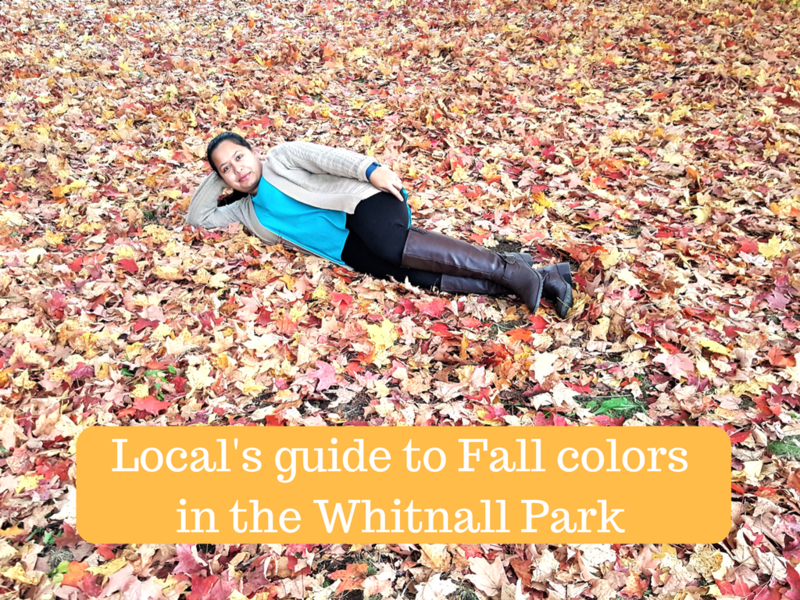 And that trip encouraged me to share local’s guide to fall colors in Whitnall Park. 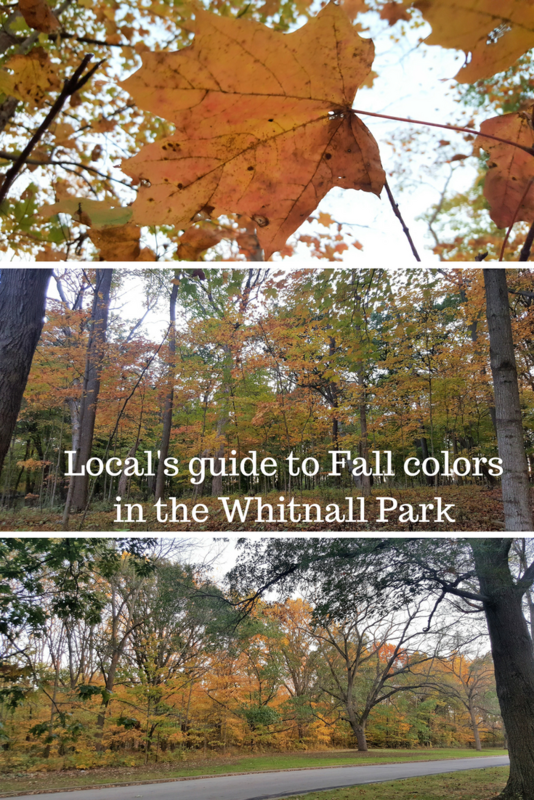 I am a frequent visitor of Whitnall park no matter the season and this is the most feasible place to view fall colors for me because I know every corner of the park. The very 1st spot I stop by is Maple collection area. This is my favorite spot because I love maple trees. Unfortunately, this time when I went to maple collection almost all leafs have fallen off the trees but I have last year’s picture to show you guys how actually it will look. Another place which you should not miss is near Whitnall park golf course. On the Whitnall Park Drive road you will see a small parking lot, park your car there and you will see downhill grassland if it’s not downhill then you are at wrong place. This is the best place to view the sunset, they have picnic benches, you can enjoy the view with your loved one. Take a Walk downhill and enter on the trail you will be surrounded by beautiful fall colors and you will also find some photo addicts like me trying to capture perfect fall picture. Not just during the fall but whenever I feel a craving for perfect sunset you will find me here. 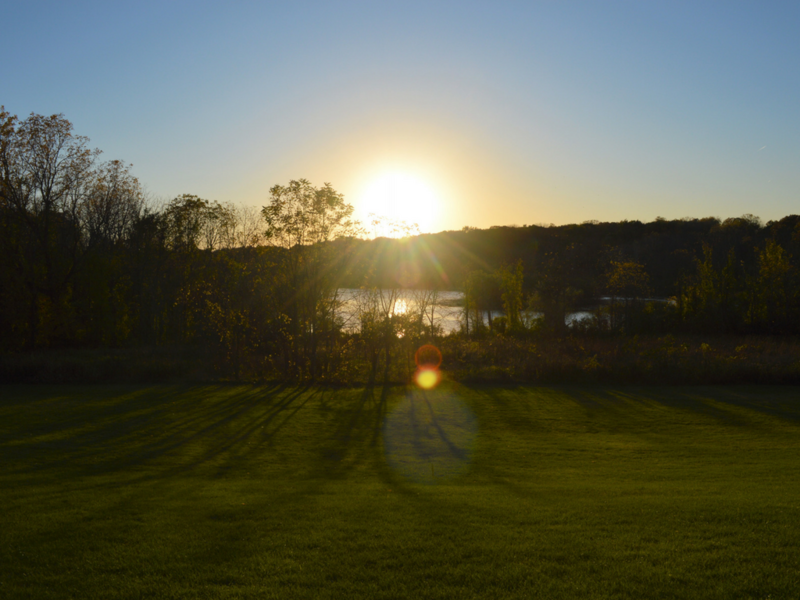 After enjoying the view of sunset we head to the Wehr nature center. Many trails run through the nature center but the trail on the right side of a parking lot is great for colors. From parking lot itself, you can see the colorful leaves floating with the air. It’s up to you how far you want to hike, we generally go till half a mile or so. You don’t need to go much farther to view fall colors. Hi, Urvis! Yet another great place you bring with such amazing details. Your love for this park is contagious, so I hope more people will be inspired to spend a day ( or few in a row, why not?) in this amazing place. Colours are beautiful and vivid, no matter they are not so many. I was wondering, what time of a year is this place most crowded? I found your blog site on google and test a couple of of your early posts. Continue to maintain up the excellent operate. I just additional up your RSS feed to my MSN News Reader. Looking for forward to reading extra from you later on!? I actually wanted to type a brief message to be able to thank you for these unique guides you are posting on this site. My rather long internet research has finally been honored with high-quality suggestions to write about with my neighbours. I would believe that most of us visitors are rather lucky to live in a fabulous website with so many lovely people with good plans. I feel very much blessed to have encountered your web site and look forward to tons of more brilliant moments reading here. Thanks a lot once again for everything. Thanks a lot for providing individuals with an extraordinarily marvellous possiblity to check tips from here. It’s always so great and also full of fun for me personally and my office peers to visit the blog at a minimum three times in one week to learn the latest items you will have. Of course, I’m actually fulfilled with the unique points you give. Some 2 ideas in this posting are easily the most effective I have had. I wanted to jot down a brief word to be able to thank you for those lovely techniques you are sharing here. My long internet investigation has finally been compensated with incredibly good content to exchange with my classmates and friends. I ‘d claim that we site visitors actually are quite fortunate to dwell in a notable place with so many wonderful professionals with great hints. I feel pretty grateful to have come across your entire website and look forward to really more entertaining times reading here. Thanks once more for all the details.